Garfish again provided anglers with an option inside Corio Bay amid more miserable conditions. Fishing land-based anywhere from Eastern Beach to North Shore rocks was a likely location, with a light berley trail essential to keeping gars in the vicinity. Pinkies and flathead were also still present throughout the inner-harbour, while anglers fishing after dark with fresh baits targeted snapper in excess of 7kg. Squid were caught from Clifton springs right round to Queenscliff, where fishing the boat harbour was also productive for silver trevally and small salmon. Angler fishing the cut should remember that the tide change is roughly 2.5 hours after Port Phillip Heads. Offshore anglers encountered plenty of nice pinkies in 30m to 50m from off Barwon Heads to Breamlea. Squid, pilchard and salmon fillets were good baits and also with the chance of attracting a gummy shark. Bream were on the hit list during the week for Trellys Geelong’s Peri Stavropoulos when he fished Lorne’s Erskine River. Using scrub worms and Z-man Motor Oil grubs he managed half a dozen fish to 35cm. The Glenelg River at Nelson has been producing sensational mulloway fishing. The river typically fishes well for undersize fish but mulloway over the 60cm minimum have been taken in best numbers all year over the past week. 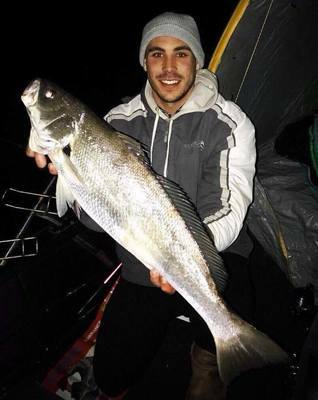 Cody Carruthers made the drive to Nelson over the weekend, catching a number of mulloway to a high of 70cm along with the odd bream on various baits including salmon fillets, squid strips and pilchards. On the freshwater front, Lake Bullen Merri was on fire for rainbow trout and Chinook salmon. Trolling Tassie Devils and diving lures in shallow water around the lake margins and the northwest side in particular was productive, with bank anglers doing well on Powerbait and lures. Lake Bolac was also worth a visit, with rainbow trout to 2kg still on the bite. Bellarine Light Game and Sport Fishing Club held a day competition at the lake over the weekend when the most success was recorded while using Powerbait.